Beam Splitters are used to split an input light beam into two separate beams with a certain reflection/transmission ratio or per different polarization. These can be used as a beam combiner combining two separate input beams into one output beam. Spectral Optics provide a wide selection range of plate beamsplitters. Regular Plate beamsplitters are ideal for high power lasers that optical cemented cube beam splitters can not be used. 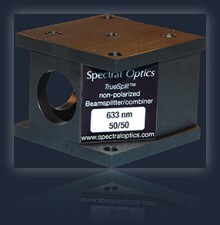 Spectral Optics offers a super thin plate beamsplitters to minimize the beam deviation. Especially for high energy Nd:YAG laser applications, harmonic beamsplitters will be useful for separating a primary wavelength and its harmonic ones. For splitting or combining two different wavelengths other than harmonics, dichroic beamsplitters are the right solutions. To separate the input beam into two by reflecting S-polarization and transmitting P-polarization, Spectral Optics offers polarizing plate beamsplitters. For some special applications that require minimal separation between P-polarization and S-polarization when splitting, non polarizing plate beamsplitters are provided.